Beautiful panorama views of the Okanagan valley from this lovely penthouse two bedroom/two bathroom condo at Pinnacle Point/Quail Ridge. Located in the heart of lake country, minutes away from exceptional golf courses, lakes and the UBC Okanagan Campus. Clean and affordable, this condo offers everything you need to begin relaxing as soon as you arrive. Pool, hot tub, fitness center are just the beginning of your adventures in the Okanagan. Our unit is located at 1875 Country Club Way. Nearby are two championship golf courses known as the Bear and the Quail (the clubhouse is only a 2 minute walk away) and will please anyone looking for comfortable, affordable accommodations. There are many more golf courses within minutes of this beautiful 2 bedroom, 2 bath, fully equipped condo. Top floor corner unit offers scenic views of the valley. The suite is also conveniently located minutes away from the airport as well as the University of British Columbia Okanagan and a short 20-minute drive to downtown Kelowna, great for golfers and families. 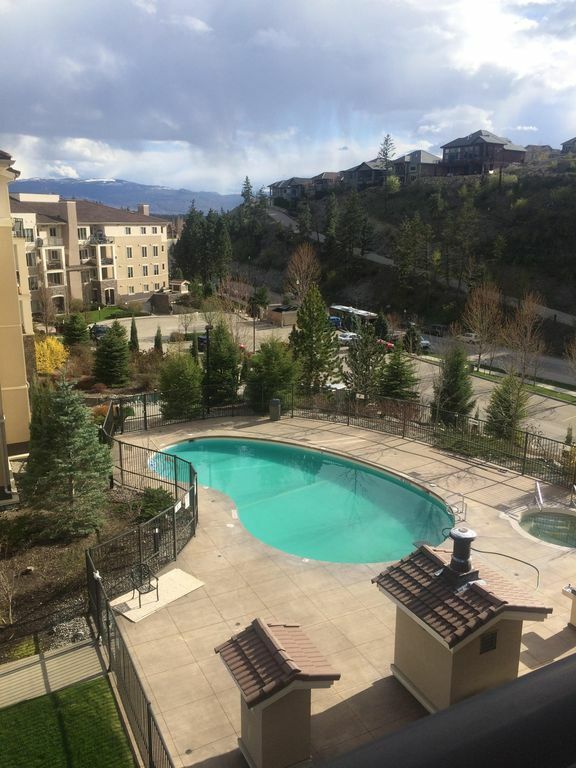 This Okanagan family friendly complex offers an outdoor pool, hot tub and fitness room. The condo is centrally located between Okanagan (South) and Kalamalka (North) lakes, both approximately 30 minutes away, as is the world class Predator Ridge Golf Course. The master bedroom has a queen bed, an ensuite bathroom and large closet. The second bedroom has a queen bed and large closet, second bathroom has a shower, and there is a double pull out sofa in the den. Flat screen TV’s in the living room and both bedrooms, with cable and wireless internet (included). The suite includes a washer and dryer, 1 underground parking stall and 1 outdoor parking space and a spacious deck with BBQ. Just a few minutes walk away: Local dining at the Okanagan Golf course, a local Pizza/Coffee shop and Day Spa . Nearby: Plaza with Nesters Market grocery store, Starbucks, Tim Hortons, liquor store and Gulfstream restaurant are just a few minutes’ drive from the condo. A short drive to lake country you can dine at The Gray Monk Estate Winery or enjoy the lake views while sipping a glass of your favorite vino from other world class wineries such as Arrowleaf, Ex Nihilo, 50th Parallel Estate, the options are ended and so is the wine. If you are looking for a beautiful location and a setting where nature is only steps away, then our condo is for you. Book early to avoid disappointment. Long-term renters are welcome. Beautiful views of The Okanagan Golf and Country Club featuring The Quail and The Bear golf courses. Great place and a convenient location. Was in town for a wedding with my husband and my parents, was a great home base for all of the festivities and we had ample space to all get comfortable and relax without being in the others space. Clean, well stocked, a great place to stay. Where do I begin? This property was our first VRBO and was amazing! We travelled to Kelowna with our 4 kids this July. The property we rented from Leanne was ideal! The kids had their own space/rooms and so did us parents. The place was immaculate, the beds were super comfortable and the amenities were awesome. The building was very quiet too. The balcony views were unforgettable. We had coffee on the deck every morning and also ate supper out there. The poo/hot tub was great because there were no time restrictions during the day. We could go in, when we wanted, and even had the place to our selves one afternoon! Having a washer/dryer in our suite was also a HUGE bonus for us. It meant arriving home with no laundry to do!! Leanne also responded very quickly to emails and was a pleasure to deal with. Situated about 20 minutes from downtown, this place was nestled amongst the rolling hills and golf courses, facing the east. There is a few amenities within close driving proximity (small grocery store, sushi rest., liquor store, Tim Hortons, DQ). I highly recommend this condo if you don't mind being away from all the hustle and bustle of downtown! I know we truly enjoyed it! Thank you Leanne! Enjoyed the beautiful views. We felt very much at home in the condo. We had a quiet and relaxing time. Everything was about 20 minutes from the condo. There was a grocery store & a few restaurants just down the hill. Very spacious unit that was very clean. Gorgeous views of the valley where you can watch the planes take off and land from the airport but you can’t hear them. Nice pool area and great hot tub but closed right at 11:00 pm. I would definitely stay here again. You can see the golf course from the condo where we had a great breakfast. Affordable getaway. Great place with a great view. Very clean and set up very well. We enjoyed our first stay in kelowna. The activities are endless for the outdoor enthusiast. The proximity of this condo to the Okanagan Golf Club makes it easy to access world class golf. The condo is well stocked and provides all the comforts of home. The views are magnificent. I would definitely return.